Masks, fins and snorkels make up the most basic equipment used by those who want to swim underwater. Your eyes are designed to work well in air. Try to use them in the much denser medium of water and you’ll have difficulty focusing because light bends differently in water. 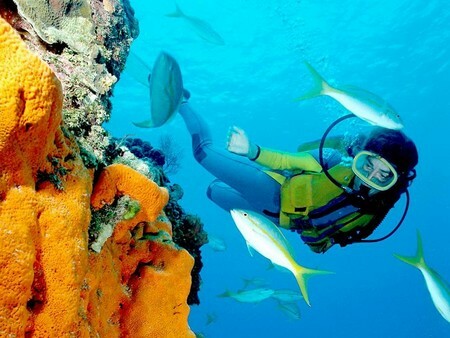 To solve this problem, divers wear a small pocket of air in front of their eyes in the form of a mask. A mask has a faceplate of tempered glass in one or more sections held by a strong frame. A supple silicone skirt forms a seal between the glass and the diver’s face. An adjustable strap holds the mask in place. Because light bends as it passes from the dense water through the less dense air in the glass, objects look bigger or closer than they really are to divers, and divers also lose their peripheral vision. Good masks have the glass positioned close to the eyes to reduce this problem. The smaller volume of air within the masks also makes them easier to clear if they are flooded with water. Skirts can be transparent or opaque. Opaque ones give a brighter view but are slightly less attractive to wear. If you need prescription lenses, many masks are now available with that option at an additional cost. Fish have fins. Marine mammals have tail fins, too, often in the form of flukes. The forelegs of seals and whales are modified to form flippers. The swimming aids divers fit to their feet are properly called fins because they enable them to use the muscles in their thighs to propel them through the water. Whether you prefer to call them ‘fins’, ‘flukes’ or ‘flippers’, this item of equipment enables divers to swim like a fish. The broad blades of fins allow divers to thrust a larger amount of water than unadorned feet, enabling them to manoeuvre easily and effectively in the water with minimum effort. Fins are available in two basic types: slipper and strap. The barefoot diver usually prefers slipper fins, which have an enclosed heel. Those who wear boots usually find the open-heel strap fins more suitable as they can be worn over a boot. Fins also are available with different-sized blades and varying amounts of flex. Those divers with strong legs will no doubt relish using fins with large robust blades, but the more relaxed diver will choose a softer or smaller blade. The latest developments in fin design include split fins. Designers claim these fins are more efficient than traditional ones. Independent tests have proven that some fins with split blades are indeed more efficient, but not all. There are many fins with conventional blades that are just as efficient. The snorkel is a tube with a mouthpiece at one end. The tube’s ideal length is around 30 cm (12 inches) as this size does not allow carbon doxide to build up. Its ideal diameter is about 2.5 cm (1 inch) as this allows a good flow of air but minimises the amount of water entering the tube. Some manu­facturers make snorkels that are self-draining or have splash guards on top. All snorkels should have a clip to attach to a mask strap.